The first thing to note is that, as far as I can tell–the first episode of this season is very much a standalone one, not part of an arc. This is probably because the entire After Story consists of a single arc, as far as I know. My expectation that they would begin the story when the characters were already out of school turned out to be wrong, probably because I was basing it off my viewing of the Clannad movie. There, it shifts to that time period almost immediately after Nagisa’s play, which is the arc that ends season 1 of the TV show. (I never properly blogged or reviewed the latter half of the first season, I know. I’ll try to keep writing these consistently from now on.) Having a single arc finally would allow all the characters to work as an ensemble, and presumably to keep the romantic stuff focused only on Nagisa and Tomoya. Which leads me to this: one welcome thing about this show, and the process started in the first season but seems to be continuing into the current one, is that it certainly no longer feels like a harem comedy. This, in spite of the names of the various girls being printed in the opening credits just like in the first season, and just like in the game. The dynamic is quite different than many game adaptations of its ilk, one that I was willing to accept in spite of my prejudices against this genre of anime. 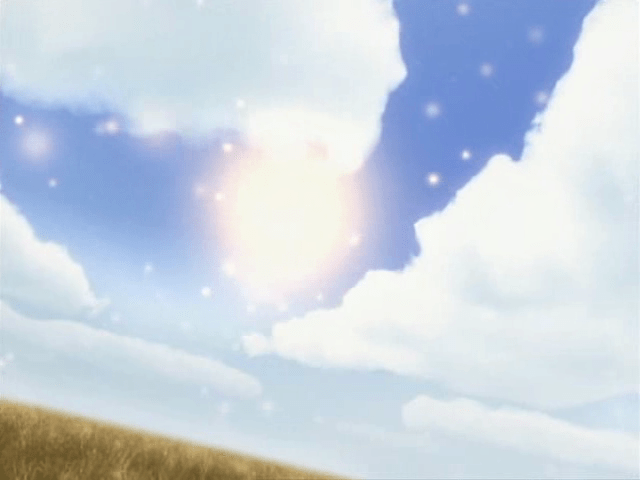 While I wouldn’t necessarily start someone with a Key production if he or she is a skeptic of the genre–I’d start with Kimikiss instead–Clannad features a lot less of the things that would irritate a newcomer. This episode, too, continues a small tradition of sports-themed episodes, and the biggest surprise to me was to see that the ragtag team was actually not a total washout. They are believably mediocre with some players having flashes of real talent, as opposed to being comically overmatched or comically super-talented. Of course, sports movie formula demands that the underdogs win, which is what happens at the end–and I found the very end of the episode to be directed in a rather unique way. 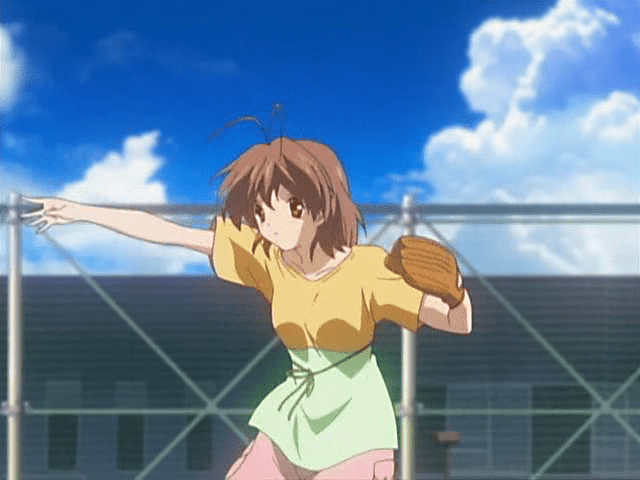 The “sad” music that was played so much in the first season plays as Tomoya takes the bat, and we get what is either a flash forward or a hopeful imagining of what it would be like to win the game, and as the ball flies in the air, it’s juxtaposed with the heretofore underexplained alternate world with the patchwork robot. The writers are skilled enough to leave the personal-triumph-over-the-injuries-of-the-past subtext of the scene unspoken. It’s a nice artistic touch that I didn’t quite expect from this sort of show, and it’s appreciated. I watched this after having watched the rather bizarre Hyakko episode 1, and I laughed more in Clannad. I don’t know what that means, really; it’s far too early to cast any judgment (remember what I said after watching only a couple of episodes of Lucky Star? 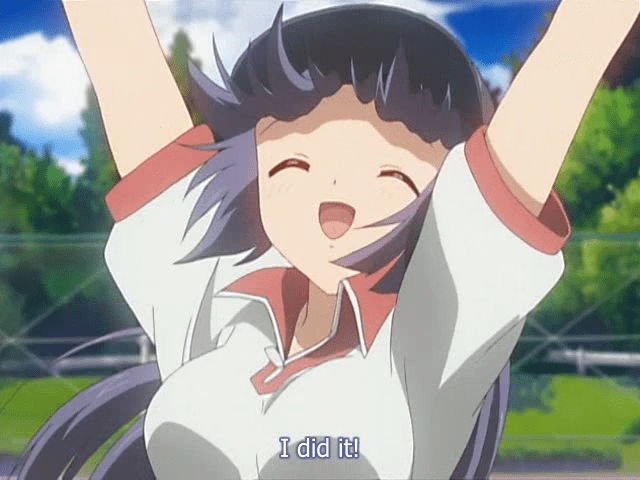 ), but episode 1 at least reconfirms that the general competence and solidity of Clannad has carried over into the current season. It was never exceptional, mind you, and it had its low points; the second half of the first season in particular was noticeably weaker than the first half. But it was always easy on the eye and easy to take, even for people like me with a relatively low tolerance for moe. In that regard, nothing’s changed. It’s still solid otaku entertainment with great animation and I should have no problem following this show alongside ef. Despite the name of the show, the director seems to have decided to spend some time with the sub-character stories before moving onto the main meal, so don’t expect the true “After Story” to start until episode 9 or so. After that it should be much smoother sailing, having as you said dispensed with the previous need to ragtag different stories into a single cohesive narrative. @FF: ah, so that’s it–there’s some ways to go before the “real” plot starts. I guess that means this is is going to go on for 24-26 episodes, then? Otherwise, they wouldn’t have the room for stuff like that. Yeah, 24 eps has been confirmed by people in the know.